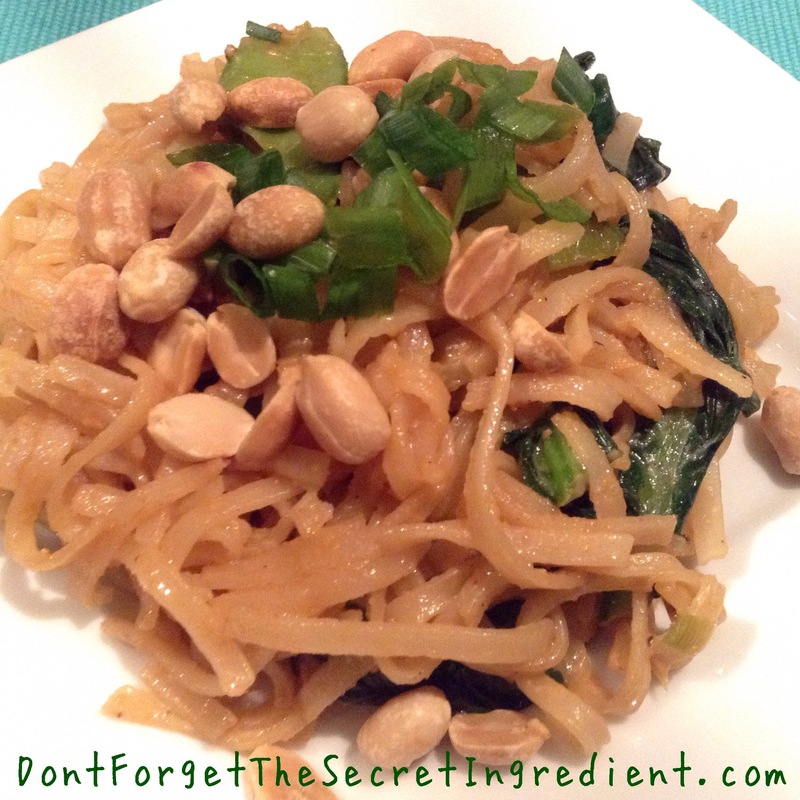 Pad Thai, is a savory, saucy, stir-fried noodle dish that I adore. Though the dish itself is said to have originated in China, it spread throughout Thailand in the 1930s and 1940s as street food. 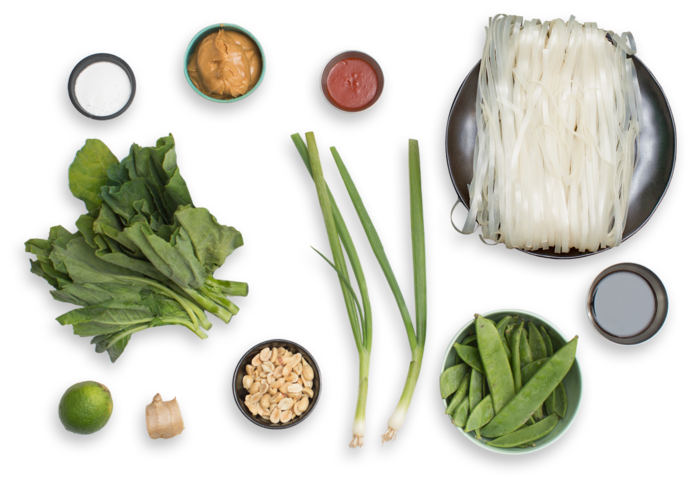 Using local ingredients and produce, Thai cooks transformed the dish’s flavor profile into what we recognize today. With peanuts, lime juice, ginger, chile sauce and coconut milk, this simple stir-fry has an array of harmonious flavors. I stumbled upon this yummy vegan dish by Blue Apron chefs. It’s easy to make, and a quick and delicious meal perfect for any season. Wash and dry the fresh produce. Heat a large pot of salted water to boiling on high. Trim off and discard the snow pea stems; pull off and discard the tough string that runs the length of each pod. Halve the snow peas on an angle. Cut off and discard the root ends of the scallions; thinly slice the scallions, separating the white bottoms and green tops. Trim off and discard the ends of the gai lan stems. Quarter the lime. Peel and mince the ginger. In a medium bowl, whisk together the coconut milk powder and ¼ cup of water. In a large pan, heat 2 teaspoons of oil on medium-high until hot. Add the white bottoms of the scallions and ginger. Cook, stirring occasionally, 2 to 3 minutes, or until softened and fragrant. Add the snow peas and gai lan to the pan of aromatics. Cook, stirring occasionally, 2 to 3 minutes, or until the gai lan has wilted. Turn off the heat. While the vegetables cook, add the noodles to the pot of boiling water. Cook 4 to 6 minutes, or until tender. Drain thoroughly and set aside. While the noodles cook, in a medium bowl, combine the peanut butter, sweet soy sauce and as much of the Sriracha as you’d like, depending on how spicy you’d like the dish to be. 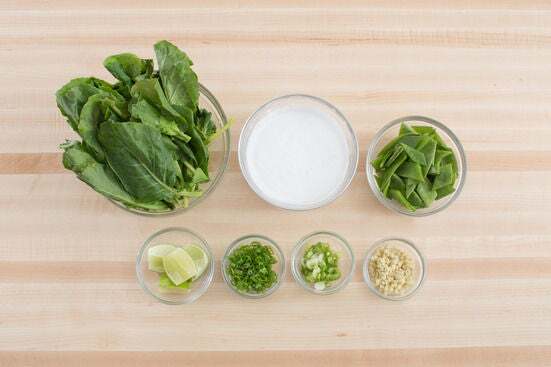 Whisk in ¼ cup of water; season with salt and pepper to taste. Add the peanut sauce and coconut milk powder mixture to the pan of vegetables; stir until thoroughly combined. Add the cooked noodles and the juice of all 4 lime wedges. Cook on medium-high, stirring to coat the noodles, 2 to 3 minutes, or until heated through. Turn off the heat and season with salt and pepper to taste. Divide the finished noodles and vegetables between 2 dishes. Garnish with the peanuts and green tops of the scallions. Enjoy! Coconut milk powder is an ingredient in most Southeast Asian cooking and is not the liquid inside a coconut. Coconut milk is classified as thick, thin, or coconut cream. Canned coconut milk separates naturally and the top layer is the coconut cream. This top layer is dehydrated to make coconut milk powder. In a pinch, you could use canned coconut milk to replace the coconut milk power and the 1/4 cup water that the recipe calls for.